Over the past several days, the excitement surrounding our “announcement” that CS5 is coming has really been amazing. The Twittersphere has been a-buzz with people asking when CS5 will be released, what’s new in their favorite product, what’s it going to cost and a multitude of other questions, hopes, suggestions and general comments. My favorite question making the rounds right now is whether or not the videos of Content Aware Fill, which the Photoshop team has posted on Facebook, is in fact real. Well, I can definitely confirm that it IS real – and I even got to sneak it to a few people at SxSW. If you are on Twitter, have a look at the #CS5 hashtag to follow the conversation. If you are a Facebook’er, check out our many fan pages to join in the discussion around your favorite product. Now, while I would like to provide you with all the answers to all of your questions, I can’t – at least, not just yet. You will have to wait until April 12th and our official Launch Event. But that is still 12 days away – so… in order to make the pain even more unbearable, we came up with an idea. Starting today, April 1st, and continuing every day up to April 12th, we have decided to give away a copy of Creative Suite 5 to one lucky (and quick) individual. We have chosen our friends at Gowalla to help us with this. Here’s how it works - at some random point during the morning, we will start to hint where the copy will be placed. At noon that day, a copy of CS5 will be “placed” in a top secret location. If you have guessed right, you will be at that location and will check in via Gowalla to see the item, if its not already claimed by a quicker clicker, its yours. The first person to log into Gowalla after the item is dropped, will be notified that they have “found a virtual copy of Creative Suite 5″ that can be redeemed for a real version by adding the item to their Gowalla collection. The winner will get to choose whether they want Design, Web or Production Premium. See the Terms and Conditions here. It’s that simple. So grab your running shoes – the first copy of Creative Suite 5 will “appear” some time today… Good Luck! Yes, agreed with Michel above, it’s not the most inclusive campaign. People are looking forward to Creative Suite all over the place. Will any of these be coming to sao paulo, brasil? We are also dropping these in places other than the United States – so, you never know! So where exactly will these hints be posted? It will be great to visit Bulgaria. We are big fans there. Yikes, I was just on my way to buy CS4 online. Now I might just have to wait a couple of weeks to get my work done. And other places than capitals? I don’t think so. it’s a pity i dont live in madrid. Where do you gets the hints to start looking for the virtual copy? Boy this would really help a disabled vet like my self in my continuing education see as how I have two web classes coming up next month. Go here, do this, log on there, check this, clue here, noon who’s time?, clue there, not available?, excluded countries?… Shhesss, the list goes on. This should have been made easier, more accessible, and GLOBAL !!! Lost opportunity. I wish they could have posted that on the first page, would have saved me alot of time, registering and installing Gowalla. Any other way to enter to win – other than using Gowalla? Seems very cool – but don’t have any of those devices. I live in Montevideo Uruguay please place one here (jejeje), it makes my odds that much better. Looking forward to CS5. Why do I have to log into a service I don’t use for this contest? Also as I help peeps learn Ps Ive got to keep my old copies installed in case they need help on older copies. Will CS5 be able to be installed with orher copies and not interfere with each other?? 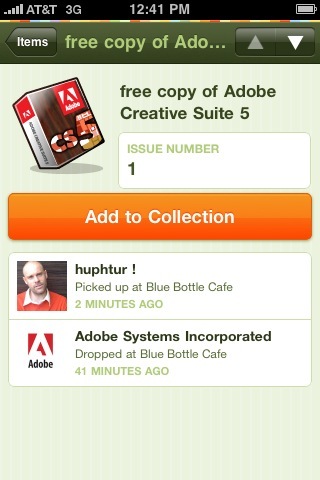 So, since you’re using Gowalla, we have to be PHYSICALLY in the location where the CS5 copy is placed? If so, that’s kind of a bummer. If not, any hints on how to check in on Gowalla if you’re not in that physical location? Unfortunately Flash CS5 is banned from compiling to iPhone so I don’t need CS5 anymore I’ll stick with what I have. Yes, the new TLF supports Arabic! I really have to admit to joe… with being banned from iPhone I don´t need CS5 anymore… by the way… cool blog ;) just found it. I am loving CS5, there are a lot of new things there.